I am monitoring this progress and will report back for those interested in following this topic. 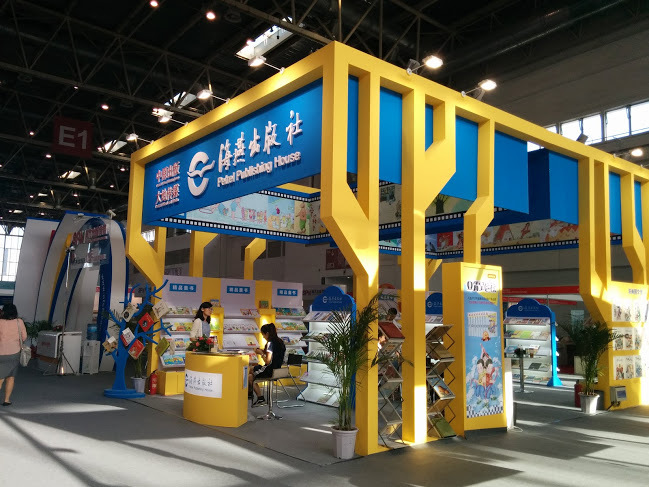 But, right out of the bag, I’d like to point out that the number of translated books for children in China has always been huge and overpowering. Look at this screenshot of the top paperback picture book bestsellers on their largest online children’s bookstore: 2 from the Netherland, 4 from the United States, and 2 from France. 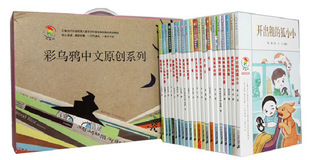 Not a single title is by Chinese authors or illustrators. Compare this to the top selling picture books on Amazon in the U.S. (There is no such category, only best selling children’s books.) There are eight picture books in the first twenty titles which are mostly Harry Potter books: First 100 Words by Roger Priddy, The Going-To-Bed Book by Sandra Boynton, The Wonderful Things… by Emily Winfield Martin, Giraffes Can’t Dance by Giles Andreae, The Giving Tree by Shel Silverstein, Oh, The Places You’ll Go! by Dr. Seuss, Richard Scarry’s The Gingerbread Man (Little Golden Book) by Nancy Nolte (Author), Richard Scarry (Illustrator), and Goodnight Moon by Margaret Wise Brown. All of them are published in the U.S., by U.S. authors and illustrators. In fact, it has always been rare for foreign, translated work for children to thrive in the U.S. marketplace. So, I imagine that the need for #OWNVOICE is real and urgent in China. 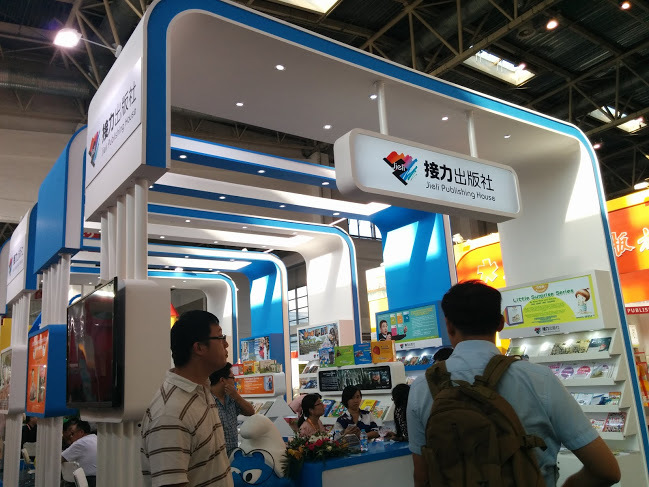 There is a reason I used this hashtag since I saw that someone invented this other hashtag on Facebook to stress that China Need Diverse Books: #CNDB (modeling after the #WNDB, We Need Diverse Books hashtag) as if the Chinese market is flushed with nothing BUT Chinese creators’ works. The reality is quite the opposite. 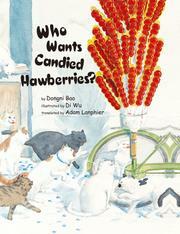 As some of you know already, I am working with Candied Plums, a new children’s book imprint, to bring contemporary Chinese books to the U.S. There is no mandate from anyone or anywhere, except for the publisher’s and my desire to bring more cultural understanding and accessibility to the U.S. readers. 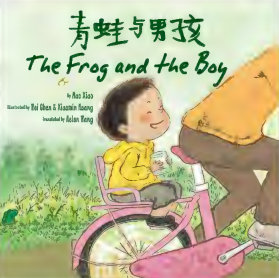 These picture books, in my opinion, do not promote the “Chinese/Communist Dogma,” nor do they convey any specific ideology except for displaying all ways that we can be human. 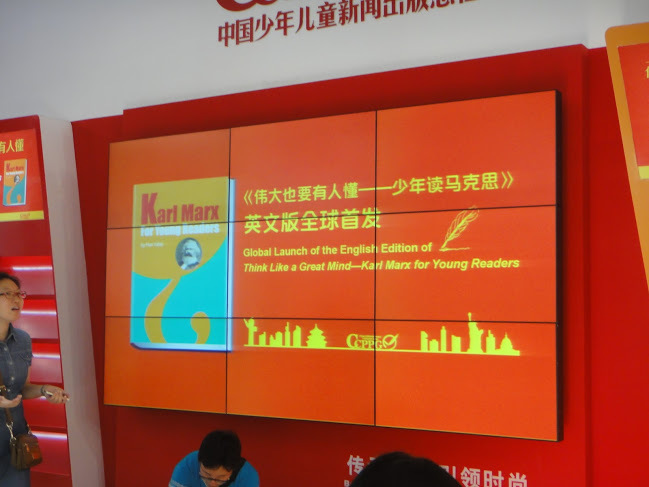 These books should be as popular in China as all the imported books. So, perhaps, just perhaps, the publishers who have been working hard at publishing their #OWNVOICES would have a better chance at reaching their #OWNREADERS with this new, drastic mandate from the Government? As we continue to understand and learn about Asian Americans and their (our) histories and cultures, it is also important to keep offering truthful windows to the contemporary Asia and its multitudes of cultures. 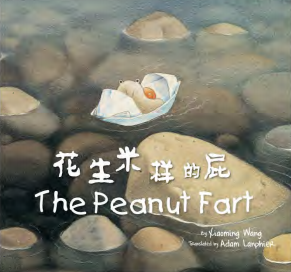 Earlier last year, I made a vow to help bridge the U.S. and the China children’s literature fields and because of lucky circumstances, I have been able to work with some dedicated publishing folks in Beijing to bring recent Chinese picture books in bilingual form to US readers. As seen on Betsy Bird’s BEA round up for some noteworthy upcoming titles, picture books from Candied Plums will be available for purchase later this year! 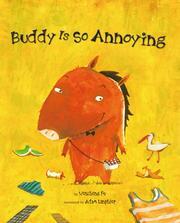 and can’t wait to share the other titles with everyone soon! 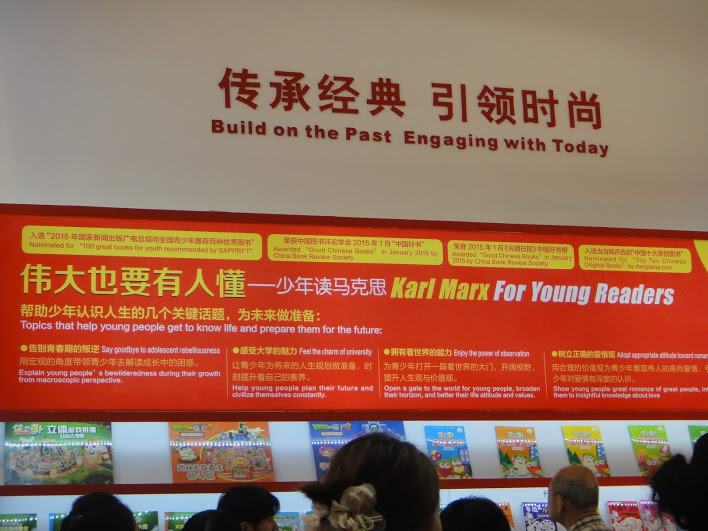 These thoughts went through my mind as I visited Beijing and the International Book Fair with a focus on the local books published for the Chinese young readers. First, simply about communication and information exchanges. It was quite an education for me to truly understand that the “WORLD” wide web as I see and use it is definitely NOT so “world wide.” YouTube, Google-platform, Facebook, and Twitter are all inaccessible in China, unless someone has installed IP masking devices (VPN, etc.) So, when I tweet or share something on Facebook from New York City, I cannot guarantee to reach the millions of potential internet users in China. According to the editor of one of the publishers, Fairrosa Cyber Library site often shows up without her being able to load the included images — and no YouTube videos can be displayed either. 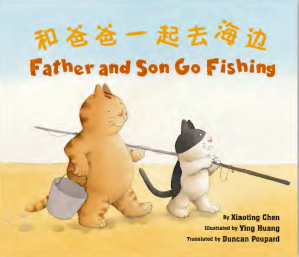 Furthermore, since my recent reports on Newbery & Caldecott winning publishers feature Google spreadsheet graphs (pie-charts), the information, without a plain text summary, was inaccessible to the Chinese readers of my blog. Although I always knew about the differences in accessibilities of certain sites in China, experiencing it first hand definitely made me think twice about my comfortable assumptions. Another striking realization came after I spoke with several representatives of major children’s book publishers: either with the editors, publishers, or rights managers: each told me that they have all sold their best titles internationally. Upon further inquiry, “internationally” means Korea and other Asian countries such as the Philippines, and France, and other European countries such as Germany. They almost NEVER meant North America, especially The United States. 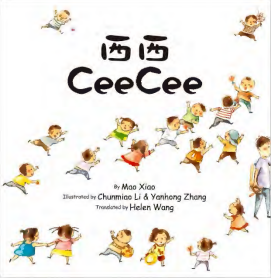 They all told a similar tale: the U.S. publishers of children’s books only wish to sell Chinese language rights and have the books available in China for sale; very rarely would a U.S. publisher seriously consider buying and translating Chinese originals into English editions for American children. I wonder if this situation will change any time soon? 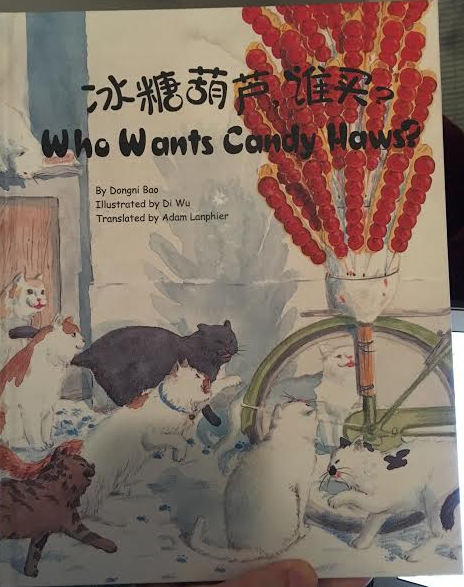 I have always noticed that translated children’s books are scarce on the U.S. market and felt sad that the U.S. children do not have the same level of exposure to world literature and diverse viewpoints and sensibilities that I had the good fortune to have, growing up in a small island country. I read books translated from all over. Some of my all time favorite books that were re-read many times were from Italy (Heart or Education of Love), France (Arsène Lupin: Gentleman Thief series), Cuba (Malfada – a satirical comic strip series), Japan (manga) and India (Buddhist allegories.) And while there have always been publishers who work hard at bringing books from other cultures to the U.S., there seems to be some difficulty to sell these titles when the cultural landscape and sensibilities differ greatly from the everyday, presumed mindset of the U.S. children. 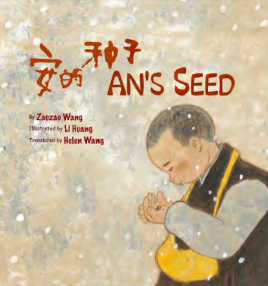 Case in point: One thing I noticed was how the strong Chinese tradition of not shying away from sad endings remains evident even in picture books for fairly young children. Tragedy is quite common in traditional Chinese literature, theater, and now TV shows and movies, and children are often familiar with many somber tales. The Last of the Panthers shows the devastating scenario of the “last” of many species and there is no uplifting or hopeful ending when our Panther gives up on itself and falls into the perpetual sleep. It is heart wrenching but so effective. A young person reading the simple text and looking at these gorgeous pictures would acutely feel the pang of loss of such majestic animal and might be inspired to be more responsible in caring for our natural world. Another title is the Hat King. A story set during the Sino-Japanese war when the boy and his grandfather (a magician skilled in “hat tricks”) had to endure the deaths of the boy’s parents at the concentration camp and even when they successfully escaped from the camp, they had no house to go back to any more. And that’s how the tale ends. This is a story almost never told to the children in the U.S. It’s powerful and bleak — but it’s also real and full of familiar affection. Will either of these titles, which are top-selling picture books, or dozens of other quality peers, ever find their way to the general U.S. mass market? And if and when they do, will they be translated faithfully and stay intact? 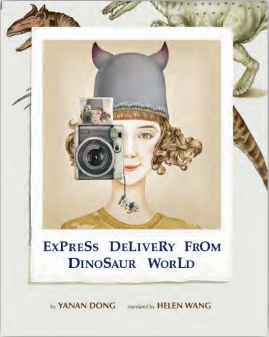 For the past 25 years, I immersed myself in the world of English Children’s and YA Literature: the output by writers, illustrators, and publishers from the U.S., the U.K., and Australia, mostly created in English. 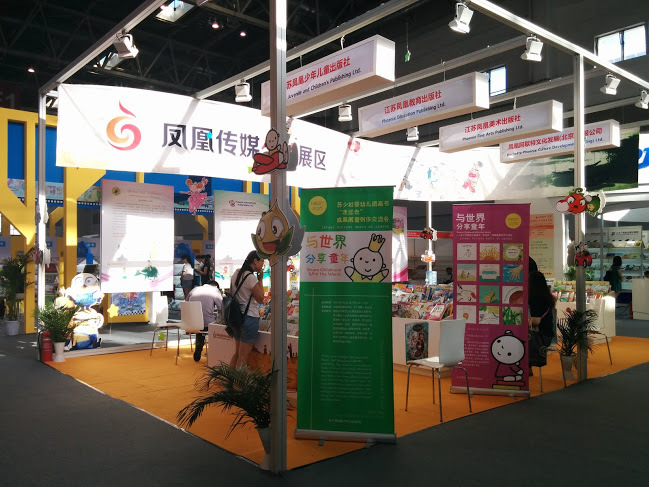 This year (and hopefully for years to come,) my focus has shifted: I’d love to see what’s going on in the Children’s Literature world in my own mother country: China (including Hong Kong and Taiwan.) 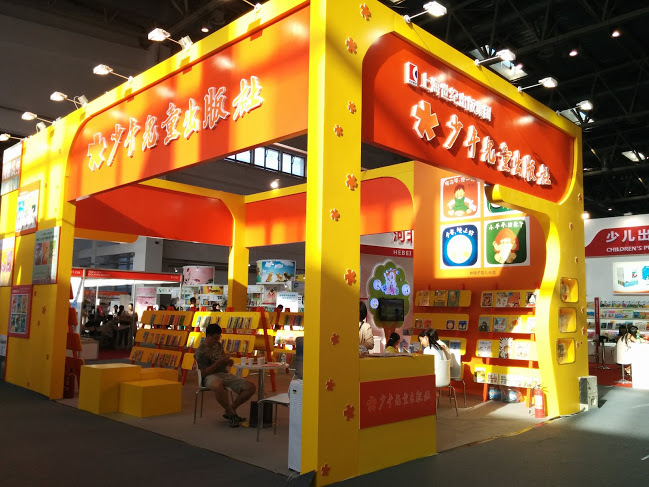 And if possible, I’d love to serve as a bridge to connect the U.S. readers (young and not so young) with contemporary children’s literature created in China, by Chinese writers and illustrators, originally written in Chinese. I’d love to help expand the U.S. readers’ understanding and reception of that vast treasure. The first step was for myself to get to know that “vast treasure” a little more. 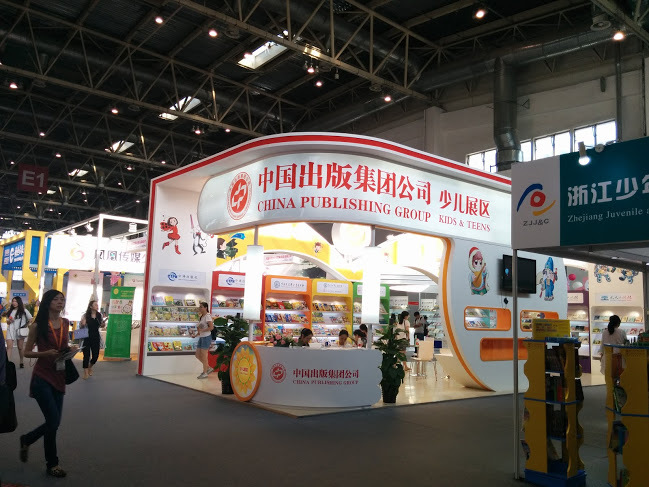 This is Sichuan Publishing Group: the branch publishers range from Science, Culture & Arts, Literature, College Textbooks, Maps, and Children’s publishing companies. 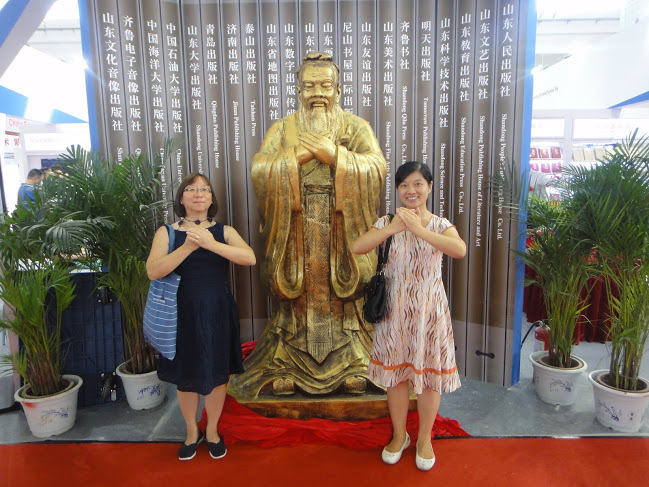 On my 10-day trip to Beijing in August 2015, attending the Beijing International Book Fair and meeting with various publishers, editors, and booksellers, I collected some names and information to share. In this post, three authors, three publishers, and one mega store are mentioned, but of course there are more in that vast land full of talented and passionate children’s book creators! As I learn more about specific titles, I will continue to report. 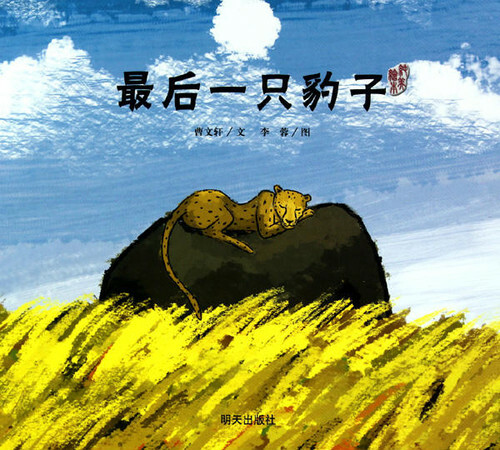 One of the most revered current children’s book author is 曹文轩 Cao Wenxuan (pronounced “tsau wen-shuan”)。He teaches Chinese literature and children’s fiction writing at the Beijing University and is sought after by many Children’s book publishers for fiction, picture books, nonfiction, and editorial advisory on book series. 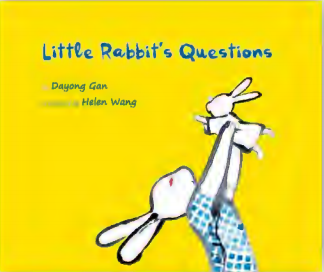 His picture books tend to be philosophical in nature, slightly wordy, and not shying away from presenting harsh realities to even the very young. Here’s a link to a short info on Wikipedia. 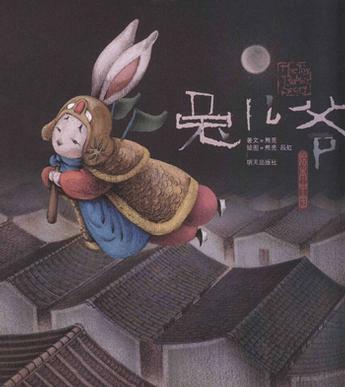 A book recently translated and published by NorthSouth Books by a Chinese author is Grandmother Lives in A Perfume Village by 方素珍 Fang Suzhen. Fang is a Taiwan native and has become really popular in China and is nicknamed “Granny Flower” (花婆婆) who has a literary blog and advises parents on how to share children’s books with their children. 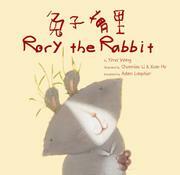 She’s the Taiwan translator for Barbara Cooney’s Miss Rumphius (Granny Flower). Fang’s blog is in Chinese. 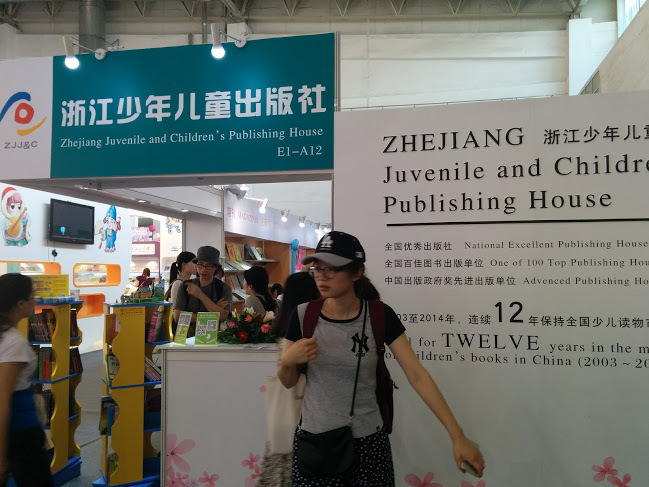 These three publishers all have their own visions and skilled editors to bring Chinese children the highest quality contemporary original works. The official and formal descriptions do not do their justice! 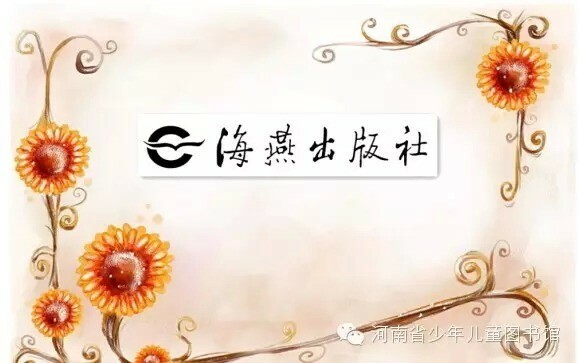 当当 (DangDang.com) is one of the major online shopping stores in China and many if not most parents buy their children’s books from this outlet which hosts book and reading events, creates age-level and genre book lists, and compiles tailormade book lists (by human sales reps, not just algorithms), etc. for their loyal customers.